What do religious Zionist youth in Israel believe? What are their sources for this belief? Does the study of Jewish Thought and Philosophy contribute to clarifying their beliefs and commitments, as their teachers and curriculum specialists would want? In this Hebrew monograph from the "Notes From ATID" series, a group of ATID Fellows set out to answer these questions based on in-depth interviews with students in the Israeli religious school system. The results question the effectiveness of current curricula, and challenge educators to develop new thought and strategies regarding the connection between studying Machshevet Yisrael (Jewish Thought) and the beliefs, behaviors, and values of their students. Dr. Yoel Finkelman is ATID's Director of Research and Projects, and a teacher at Midreshet Lindenbaum. This work was co-authored by a team of ATID Fellows: Yossi Eizman, Daphna Fishman Secunda, Avi Rokach, Ayal Vizenfeld, Moshe Weinstock, Daniel Wolf. 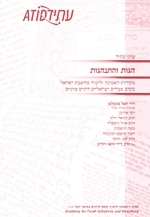 The volume contains a response essay by Rabbi Dr. Yochai Rudik, inspector for Jewish Thought in the Israeli Ministry of Education, Department of Religious Education.